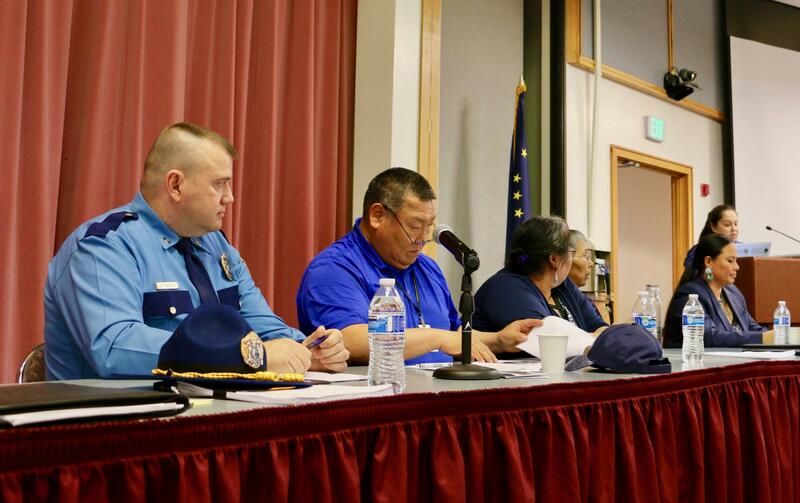 Panelists discuss the state of public safety in the Y-K Delta at the 2018 annual AVCP Convention on Oct. 3, 2018 in the Bethel Cultural Center: (left to right) Trooper Capt. Andrew Merrill, AVCP VPSO Coordinator Alvin Jimmie, Lower Kalskag Village Council President Phyllis Evan, Hamilton Tribal Administrator Della Hunt, Tanana Chiefs Conference Tribal Government Specialist Jody Potts, and AVCP Program Administrator Martha Whitman-Kassock. This time last year, there were eight Village Public Safety Officers across the Yukon-Kuskokwim Delta. Now there are nine, and one more is undergoing a background check as part of the application process. The region contains 56 tribes, and many don’t have any law enforcement at all. Over the past two years, public safety has been named the region’s top priority by delegates to conventions of the Association of Village Council Presidents. At this year’s gathering in Bethel, a panel discussed how to recruit and retain VPSOs. Phyllis Evan is President of the Lower Kalskag Tribal Council. In May, Lower Kalskag hired its first law enforcement officer in a long time: a Tribal Police Officer. Before that, tribal council members and community volunteers were the ones responding to emergencies. Now, even with a TPO, Evan remains on call. Lower Kalskag would prefer to have a VPSO. So would Kotlik, where Hamilton Tribal Administrator Della Hunt lives. Kotlik once had a VPSO hired from the village, but Hunt says that other people in the community would pick on him or threaten his family, and he soon quit. Now there’s no law enforcement in Kotlik, and the community’s only recourse during dangerous situations is to go on lockdown until a Trooper flies in from somewhere else. “A lot of locals don’t want to do the job, so we have to hire people from the outside and they cannot live in a rural village on the wage that they make,” explained Jody Potts, who used to work as a VPSO and is currently a Tribal Government Specialist with the Tanana Chiefs Conference. She also serves on the governor’s Tribal Advisory Council and participated in the Association of Village Council Presidents’ public safety panel. The number of Village Public Safety Officers is at its lowest point across Alaska, and Potts claims that the state already knows how to increase recruitment and retention. This fall, Troopers received a 7.5 percent pay increase to make the positions more competitive with other law enforcement agencies in the state. Gov. Bill Walker has proposed a 7.5 percent pay increase for VPSOs as well. Under the Alaska constitution, the state holds criminal jurisdiction across Alaska. But Potts sees rural communities receiving a lower standard of public safety than urban areas and communities on the road system. These rural communities are predominately Alaska Native. Closing the gap, Potts thinks, will require the state Legislature to not only provide more funding, but to change their attitude toward rural Alaska overall. “Getting them to believe in the program and believe that VPSOs deserve and villages deserve equal service is going to be a big challenge,” she said. A decade ago, there were 30 VPSO’s across the region. Those numbers were already in decline when in 2015 the state allowed VPSO to carry firearms. This change raised the positions' hiring standards and put the job out of reach for many rural residents. Alvin Jimmie coordinates the VPSO program for AVCP and told the convention that the two main barriers for applicants in the region are drug use and criminal incidents on their records. Jimmie has been traveling the Yukon-Kuskokwim Delta, surveying the public safety infrastructure across the region. In August, AVCP held a public safety summit with partners from across the state. One idea that arose from the summit was to have roving VPSOs that float throughout AVCP’s 13 units. AVCP plans to release a regional public safety assessment later this year. Trooper Captain Andrew Merrill commands the state’s VPSO program. He told the convention that the voices of rural residents are being heard. Improvements to the 911 system continue rolling out across Western Alaska, and Troopers have received half a million dollars in additional funding to travel to communities for non-emergency events such as potlatches and basketball tournaments. AVCP would not permit its staff to be interviewed for this story, and this year, for the first time, AVCP would not allow KYUK to record any part of its annual convention. For more than a decade, KYUK had enjoyed providing sections of the convention to listeners who were unable to attend the event in Bethel.